Dec. 5, 2017 7:30 p.m. 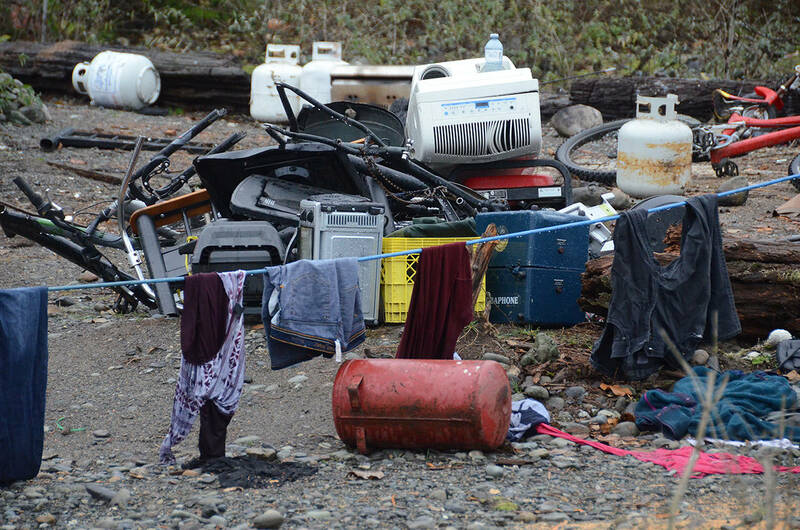 Hundreds of needles, evidence of cooking methamphetamine, along with piles of garbage and stolen items were among what was found at a homeless camp on the banks of the Chilliwack River as cleanup began Tuesday. 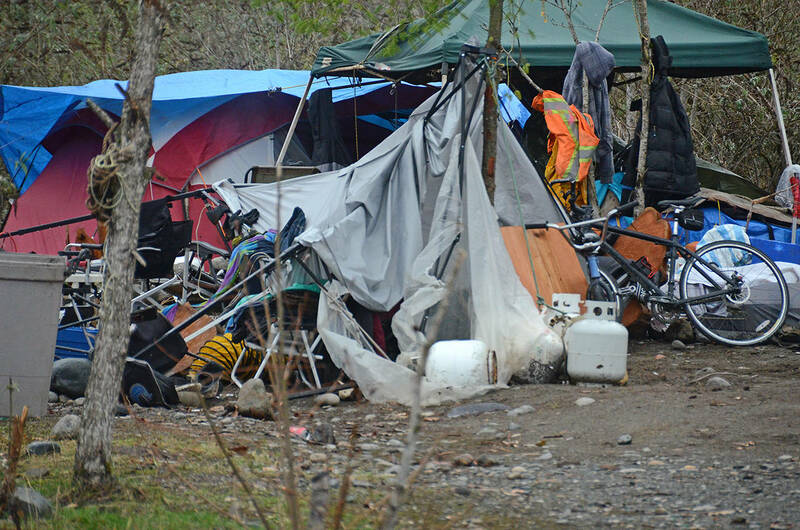 “We found 305 needles so far in one camp,” Drew Goldstone with Griffin Security said at around noon Tuesday as they conducted sweeps of various camping sites on the north side of the river just up from the Vedder Bridge near Teskey Rock. By the end of counting that day, that had quadrupled to something close to 1,200 syringes. “We have just about filled a five-gallon sharps container,” Brian Goldstone with Griffin said Tuesday evening. 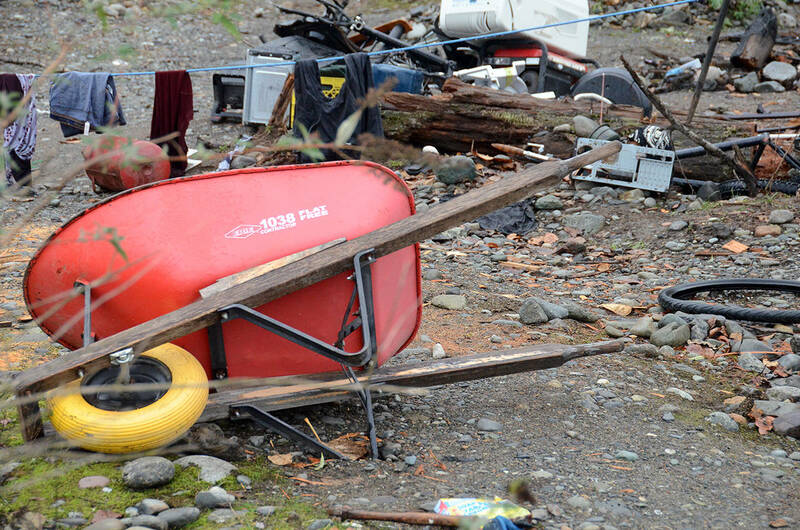 Some neighbours and river users have complained about the individuals in the camp for months, pointing to obviously stolen goods throughout the camp and the environmental mess as water rose. 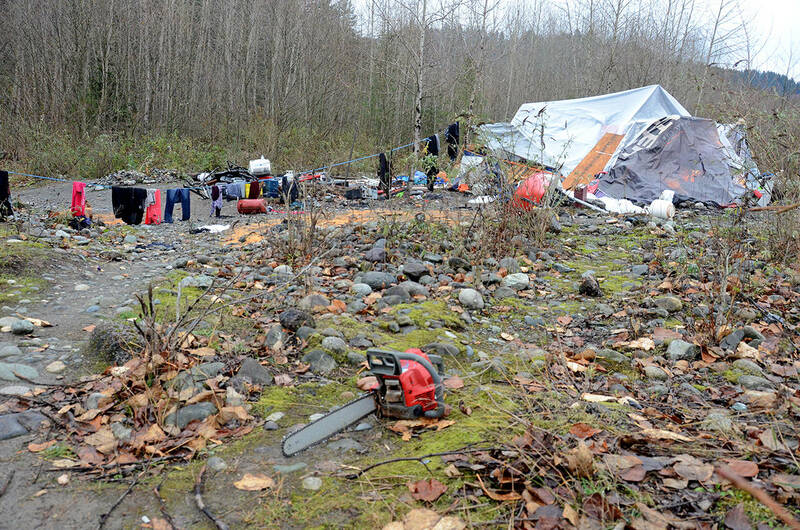 Where the campers will go is somewhat uncertain, although Natural Resource Officers (NRO) at the scene said they asked, and all those present in the camp were co-operative and said they had other places to go. Representatives from social services and the Salvation Army have already visited the site to talk to campers. 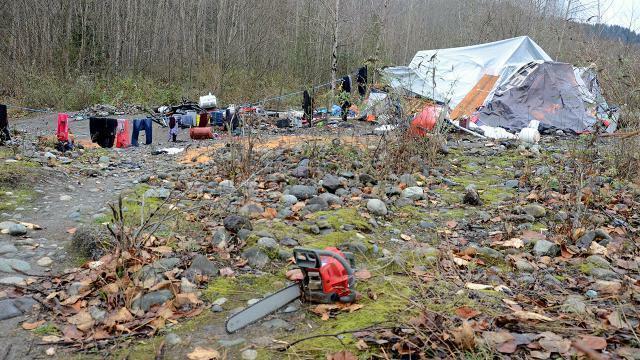 While The Progress was talking to officers near the road, one individual on a BMX bike with a backpack with an axe handle sticking out and a chainsaw strapped to it slowly rode further into the Chilliwack River Valley. Asked what took so long for the crackdown and cleanup — which will be expensive and involve a helicopter on Wednesday — one NRO said compassion was part of it. But the practical problem is one of resources. 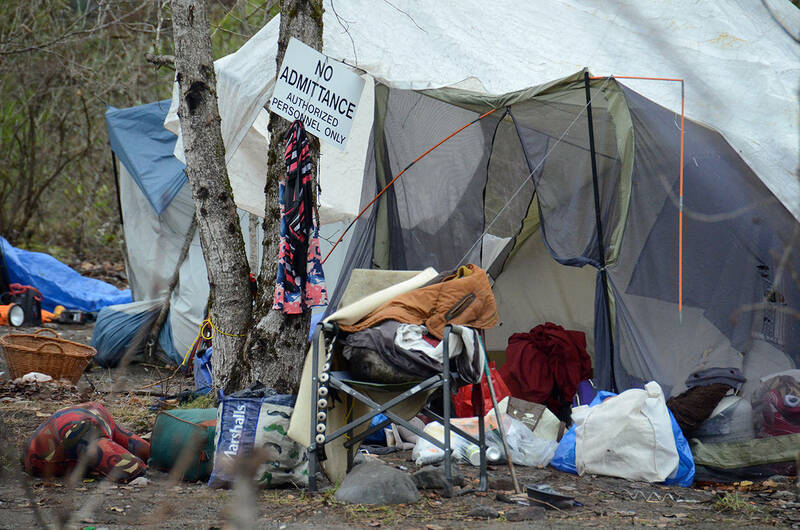 The site is subject to an order under section 58 of the Forest and Range Practices Act forbidding any camping of any kind by anyone on the property. 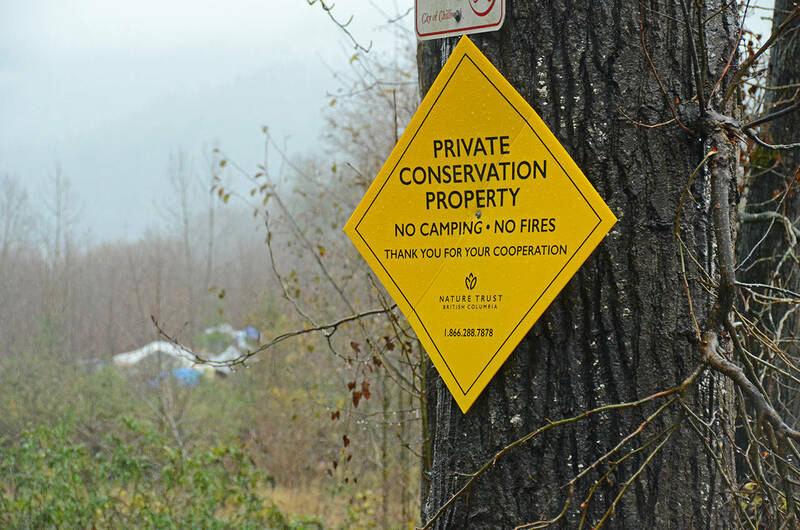 But talking about the issue, NRO Robert Cunneyworth and Curt Bueckert said the wildfires this summer strapped resources for an already busy Chilliwack office. The NROs on Tuesday confirmed that some of those in the camp being dismantled this week came from that camp.